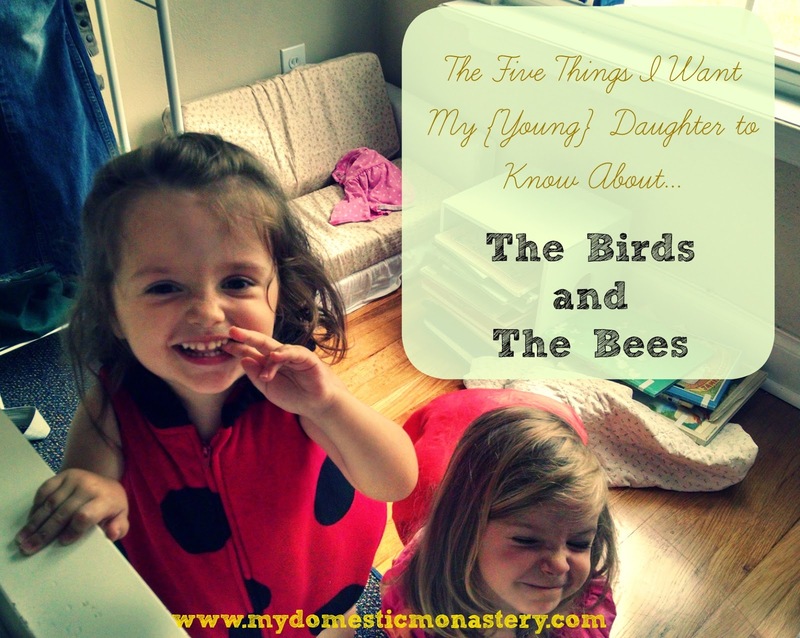 Last week, I loved sharing with you the five things I would tell you if you were my daughter. This week I want to share with you something else on my heart. I feel like, in our over-sexualized culture, it's hard to maintain the innocence of young children. While I understand the sentiment in an article like this one, I think something fundamental is missing. Children learn best about sexuality from their parents, and so parents are the ones we must equip to teach them. You body is a beautiful gift for you to take care of. When I bathe them, we do talk about taking care of our bodies. I'm teaching my oldest how to bathe herself, and so we talk about the importance of staying clean all over. If she asks about a private area of her body (we refer to it as their "privacy" at this age, but I'm sure your family has their own terminology that works for you) I reaffirm for her, "Oh, yes! You should wash that part of your body, too. It's important to take good care of your body, so it can be healthy." I'll admit, I feel uncomfortable when they ask questions or point to certain body parts of theirs and whatnot. I try my best, though, to be calm and comfortable about it, and to just affirm for them the goodness of their bodies. God made them beautifully and wondrously, and it is for this reason that we care for our bodies. We need to be modest. Our family believes in modesty, but it's not extreme in the least. We wear pants and shorts and tank tops. Modesty, though, is about dressing appropriately for a given situation. When we go to Sunday Mass, dressing modestly means wearing our nicest clothes. When we go for a walk or a bike ride on a summer's day, dressing modestly may mean wearing shorts and a tank top. When we're going to bed, dressing modestly may mean wearing an undershirt and pj shorts (because it is soooo hot and muggy in the summer around here). The biggest thing to know about modesty in dress is that different clothing has a place at different times. However, there are some things that are not modest, period. We cover certain parts of our bodies because they are private to us - it isn't anyone else's business to see or touch them. (Of course I tell them that if anyone does try to do something like that they should say "No!" and tell Mommy and Daddy.) Our bodies are good, but they are also ours. We try to make it a little goofy, too. At some point when Therese was a toddler, we started joking about "embarrassing ourselves" if we didn't leave our clothes on or were dressed inappropriately (because crazy toddlers never seem to want to wear their clothes and it can be downright embarrassing at times, haha). That's still our special little terminology. But a caveat - it isn't embarrassing because your body is bad (and our girls know that). It's embarrassing because it doesn't fit the situation. Wearing a bathing suit (or its equivalent) to a restaurant would be embarrassing! Find terminology that works for your family, to help convey the importance of appropriateness. It's okay to express your feelings. I feel like our culture tends to swing one of two ways - either we're encouraged to constantly act on our feelings and desires, or we're encouraged to stifle them. But somewhere between those two extremes is the truth. Part of having a healthy sexuality is being able to acknowledge and express your emotions and desires - but in an appropriate way. At 4 years old, this means learning that it's okay to feel mad, or scared, or frustrated, but it's not okay to yell about those feelings. It is okay to talk about them with Mommy and Daddy, and to try and figure out how to work through them or express them in a calm way. I want our daughters to know that it's okay to feel feelings, but your feelings aren't the boss - you are. You don't have to act on your feelings, even very strong ones. BUT it is important for little ones to know that feelings are okay, and that it is good and healthy to share how they feel about things with the people they can trust (i.e. Mommy and Daddy). How we experience the world and relationships is a big part of our sexuality, and I want to keep the doors of communication wide open from the start. Right now, the conversation may be about a friend who hurt their feelings, but one day it will be about a boy/girl relationship. I want them to know we're here to talk to! Ultimately, this lays the ground for chastity - recognizing your feelings and desires, knowing them to be good, but then expressing them in an appropriate way, given your state in life. It's okay to trust your instincts. I have a daughter who tends to be scared of just about everything, but not of people. I have another daughter is scared of most people but not most things. I have a hard time being patient with them when they're scared of anything (especially seemingly irrational things) but I'm trying to work on that. I want them to know that it's okay to be afraid or unsure, and to help them to see how to navigate those feelings. Ultimately, this helps them to get a sense for whether or not other people are people they can trust. I try to help them to have people they can trust in their lives, and to monitor and cultivate those relationships with family and friends. But I also try to acknowledge if they are unsure about something. Like I said, I struggle with patience, so I'm still working on this one. But I want my girls to know that what they sense matters, and it's okay to trust their gut. It is so, so important for all children to hear that they are loved, but especially for little girls to hear that...and especially from their daddy. I want my girls to know what real, respectful, sacrificial love looks like. I want to model that in our marriage, if I can, but I also want them to experience that kind of love from us, their parents. When Andrew and I were engaged, I remember telling him over and over again that I hoped we'd have little girls, because I thought he would be an amazing father of daughters. He was always so gentle, so respectful to me while we were dating, and I knew that's the kind of father I wanted for my future daughters. I'm happy to say that he's definitely lived up to (and exceeded!) my expectations. But of course, they need to know that they deserve love and respect from their mother and their sister, too. They need to know that they deserve love and respect from friends. We have a strict no hitting rule in our family, and we also jump in the second someone talks disrespectfully to another family member. We want them to know how they should treat others, but we also want them to know that they are safe and loved in our home. What tips do you have for teaching your daughters about this?